MDETERM The matrix determinant of an array. MINVERSE The inverse matrix of an array. MMULT The matrix product of two arrays. TRANSPOSE The matrix transposed (i.e. with its orientation changed). The matrix determinant of an array. 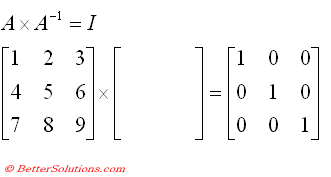 The inverse matrix of an array. The matrix product of two arrays. The matrix transposed (i.e. with its orientation changed). Rectangular arrays of numbers are called matrices. A matrix can be represented as any small table of numbers. A single column matrix is called a column vector. A single row matrix is called a row vector. A matrix is said to be square if it has the same number of rows and columns. 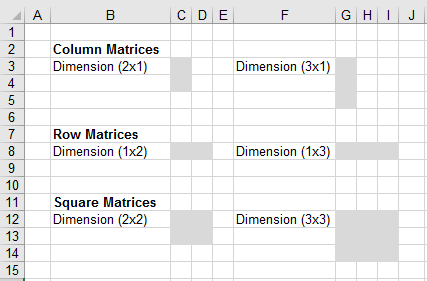 You can only add matrices that have the same dimension. There is no special Excel function to add because you can use straight addition. The inverse of a matrix is the matrix which when multiplied together gives the identity matrix. The MINVERSE function returns the inverse of the matrix as an array formula. This is usually entered as an array function and therefore must be entered with (Ctrl + Shift + Enter). To find out more about Array Formulas and Functions, please refer to the Array Formulas section. Only square matrices "can have" inverses. Not all square matrices have inverses. To prove that these are infact the correct inverses we need to multiply the two matrices together. This is shown below. A matrix that has no inverse has a determinant of zero and is said to be singular. Not all square matrices have inverses. A square matrix with an inverse is called "invertible" or "nonsingular". A square matrix with no inverse is called "noninvertible" or "singular". The MMULT function returns the product of two matrices. You must have a common dimension in the matrices that you want to multiple together. The number of columns for one must equal the number of rows for the other. Matrix A multiplied by Matrix B is not the same as Matrix B multiplied by Matrix A (i.e. matrix multiplication is not commutative). 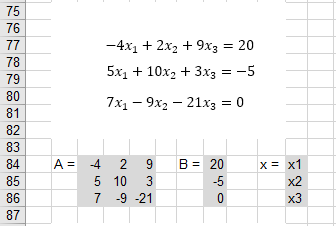 It is possible to use matrices to solve linear equations. The TRANSPOSE function will transpose a matrix and return an array formula. Transposing an array converts rows into columns and columns into rows. The transpose of a column vector will be a row vector. The first row of the input array becomes the first column of the output array. The MDETERM function returns the matrix determinant as an array formula. This function only has an accuracy of 16 digits so a singular array may return a result that differs by 1E-16. You can use the inverse of a matrix to solve a set of equations. There is not always a solution. Ax = b has a unique solution only if the matrix A is squares and has an inverse. When using the MDETERM, MINVERSE and MMULT functions every cell in the array must contain a numeric value. If not the function will return #VALUE! A matrix with "m" rows and "n" columns is said to be of order (m * n). When "m" and "n" are equal then the matrix is said to be square. Two matrices are said to be identical if every element in one matrix equals the corresponding element in the other matrix. 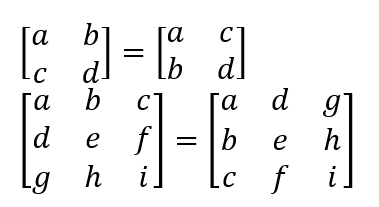 Matrix multiplication is not commutative so (A * B) does not equal (B * A). An identity matrix is a square matrix that contains all zeros except the main diagonal contains the value 1.